We chose a park with only backpack-only sites. So, we had to find a way to keep our water liquid at least until it was time for morning coffee. So, we filled 5 insulated containers with boiling water, around noon before we departed. My old, long, skinny Thermos® Nissan™ brand insulated beverage bottle keeps stuff hot for the longest, which was unexpected, given the form factor. The green Stanley fat (soup-sized) boy is next. My brand-new blue HydroFlask appears to need more testing, though it performed well with my post-run hot chocolate, this past weekend – a mere 3-hour test. 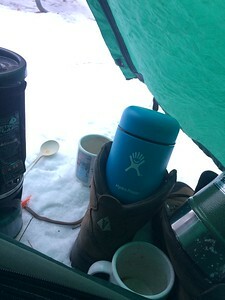 Performing even less well were an Eddie Bauer thermos and an insulated Kleen Kanteen, though our primary goal was met by all: none of our water froze – due in part to the fact that the temperature hovered around 30 during our whole stay. Had it been below zero, as it was on our December trip, perhaps these test results would be different – but we do plan to properly prepare all containers by warming each of them up first with warm tap water. Hot chocolate would have been nice for dessert – we’ll bring it next time. We certainly have enough thermoses! And enough hot chocolate. In lieu of that, we sipped on some Basil Hayden bourbon, in the tent. Putting chemical handwarmer packets into my socks, when I was in my sleeping bag, kept my feet much warmer (than last time, when I didn’t do this). I think this is a viable plan for the future, though I am curious to know if down booties would work as well, or better. Bring metal (or carbon fiber) traction assistance. We both have over-boot contraptions that would should have remembered. Every walking surface in the park had about an inch of ice, covered lightly with snow. We managed to not fall even once, but both of us were exhausted the day after, from penguin-walking the whole time, including while we “enjoyed” the campfire. My Kahtoohla Microspikes would’ve been great; Steve has some Yaktrax that would have made tending the fire less of a workout for him. I think we will save backpack-camping for summer, from here on out: we needed chairs (normal-height ones – no Therma-Rest converto-barco-loungers), in order to tend to, and relax by, the fire. This plan will also allow for an extra blanket in the tent, as we did in December. Standing or sitting still in cold weather was … cold. I had packed several extra layers including some super-heavy fleece pants, and I had them all on, in the evening. The fire was great, but we couldn’t get close enough to it to gather much of its warmth. We were kind of looking forward to a conversation with the ranger, when we arrived. From what I’ve seen both on the website and from a prior chat with a ranger, we appear to be the only people who reserve a site in winter. Other people are clearly saving themselves some cash, but we feel that our reservation commits us, and also saves us hassle of several kinds (including the new protocol or reserving a site upon arrival, calling the reservation switchboard from the campsite itself). Alas, by our 3:3opm arrival, the ranger had gone home for the day. We may try not reserving ahead for February’s adventure. As we do on most of these trips, we grabbed lunch on the way, at a place we hadn’t been to before. 3 Squares, a Blue-Plate group restaurant, served up a great lunch for us. We love their pierogy! I’m glad I’d made no plans for the Sunday of that weekend. Thanks to our new, huge Exped mattress, we slept well, aside from multiple pee breaks. We also slept long – we got into the tent before 7pm and got out of it around 8am (funny that this story came out the next week. It’s about winter camping’s effect on sleep.). However, all the extra effort we made to avoid falling while not in the tent was exhausting! The remainder of Sunday (we returned home before noon) was spent on the sofa, wearing slippers, sipping hot tea and going to bed very early. This was a rare Sunday of hygge for me! We did a great job packing and backpacking. We got everything we needed stuffed into our biggest packs, before leaving the house. The new double-wide sleeping pad almost completely filled my big pack. Steve took almost all the rest of the gear in his. And, we brought along trekking poles that made the short, icy hike to the campsite a little easier. Also: this trip marked our return to Lake Maria State Park, to “take it back.” 15 or so years ago in the summer, we visited, with intent to camp. We were in the park for less than 30 minutes and decided to go home: the mosquitoes were terrible! While there, we saw a group of campers escaping from the night before, and they looked weary and puffy. No biters this time! But we did see a few adorable bugs, on the snow. And this is a beautiful park – the small portion of it that we enjoyed for our short stay. Our campsite had an entire lake to itself! I’m glad we went here. Seven months down, five to go!